RotorS is a MAV gazebo simulator developed by the Autonomous Systems Lab at ETH Zurich. 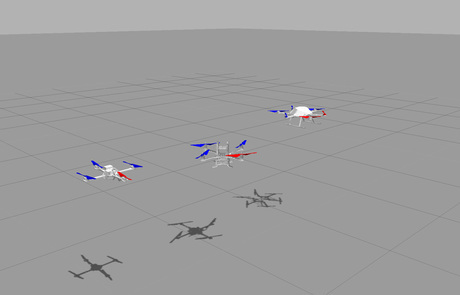 It provides some multirotor models such as the AscTec Hummingbird, the AscTec Pelican, or the AscTec Firefly, but the simulator is not limited for the use with these multicopters. There are simulated sensors coming with the simulator such as an IMU, a generic odometry sensor, and the VI-Sensor, which can be mounted on the multirotor. This packages also contains some example controllers, basic worlds, a joystick interface, and example launch files. Below we provide the instructions necessary for getting started. See RotorS' wiki for more instructions and examples (https://github.com/ethz-asl/rotors_simulator/wiki). 4GB RAM available to the Virtual Machine and up to 2GB of GPU memory assigned to the Virtual Machine. These settings are indicative and can be changed using the VMPlayer interface. You will need a system with GPU-based 3D Acceleration. 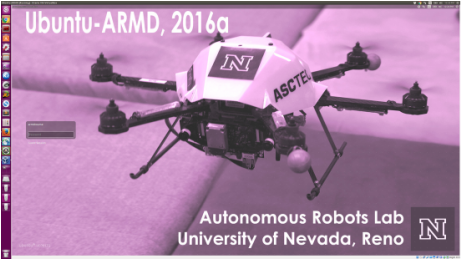 The Autonomous Robots Lab at UNR employs identical physical aerial robots such as those simulated in the RotorS. To start using RotorS using the prepared Virtual Machine jump directly to "Basic Usage"
Note for setups with multiple workspaces please refer to the official documentation at http://docs.ros.org/independent/api/rosinstall/html/ by replacing rosws by wstool. $ catkin init  # If you haven't done this before. Launch the simulator with a hex-rotor helicopter model, in our case, the AscTec Firefly. Note The first run of gazebo might take considerably long, as it will download some models from an online database. or you can send the following service call. There are some basic launch files where you can load the different multicopters with additional sensors. They can all be found in ~/catkin_ws/src/rotors_simulator/rotors_gazebo/launch. To let the multicopter fly you need to generate thrust with the rotors, this is achieved by sending commands to the multicopter, which make the rotors spin. There are currently a few ways to send commands to the multicopter, we will show one of them here. The rest is documented here in our Wiki. We will here also show how to write a stabilizing controller and how you can control the multicopter with a joystick. We will for now just send some constant motor velocities to the multicopter. Note The size of the motor_speed array should be equal to the number of motors you have in your model of choice (e.g. 6 in the Firefly model). You should see (if you unpaused the simulator and you have a multicopter in it), that the rotors start spinning. The thrust generated by these motor velocities is not enough though to let the multicopter take off. You can play with the numbers and will realize that the Firefly will take off with motor speeds of about 545 on each rotor. 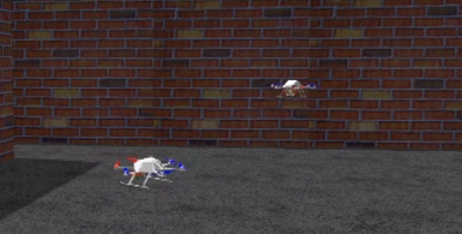 The multicopter is unstable though, since there is no controller running, if you just set the motor speeds. Contact Dr. Kostas Alexis to arrange an appointment and discuss focus desired contributions.